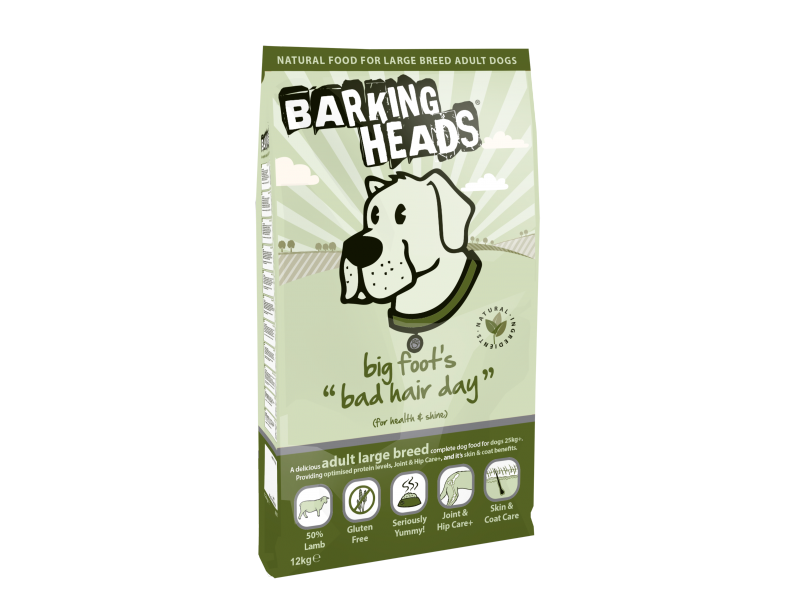 Barking Heads Big Foot Bad Hair Day is a nutritionally tailored diet for adult large breed dogs, containing carefully selected, natural ingredients to nourish and protect from the inside out. The food is fortified with advanced vitamins and minerals for complete health maintenance, as well as 45% deboned and dried lamb combined, providing a rich and wholesome source of protein. Calcium and phosphorous are found in the diet in balanced quantities to promote and support the health of joints and hips in more active adult dogs. The recipe is highly digestible to be gentle on stomachs and combines palatable, natural flavours to suit even the fussiest appetites. The following table is a guide to feeding Barking Heads Big Foot Lamb. All dogs are unique and other factors such as age, activity levels, growth spurts can have an effect on their nutritional needs. Please check with your vet that you dog is at their correct healthy weight. Although your dog may want to devour the whole bag we recommend that your introduce any new food gradually, replacing 25% of their existing food every day until they are eating 100% Barking Heads. Daily Suggested feeding amounts for Barking Heads Big Foot Lamb. Below are some recent questions we've received regarding Barking Heads Big Foot Bad Hair Day Lamb Dog Food, including answers from our team. Protein levels? And Fat percentage? Trying to gain lean muscle mass on my collie. He is very sensitive to foods. Cannot eat chicken ingredients at all. Lamb flavour, please advise of the protein and fat analysis. The protein content is 24% and the fat content is 14%.